This is an easy go-to recipe that can be the center piece of many dishes. A healthier version of fried chicken. It is very economical and flexible enough to be totally casual or part of an elegant meal. Toss the cutlet on a bun for a tasty sandwich, serve with waffles and a lemon syrup, top with mozzarella and serve with spaghetti for chicken Parmesan, or serve as I did with a side of garlic and parmesan angel hair pasta and steamed asparagus. This recipe uses the herb, parsley. I have had many people comment about parsley not really having any flavor, and how it’s only supposed to be a plate garnish. So untrue! Parsley, especially fresh, is very flavorful. 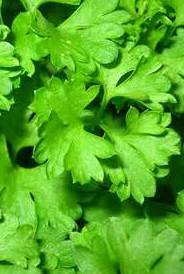 There are two types of parsley that you commonly see in cooking: flat leaf and curly. Flat leaf has a good flavor and is used in many traditional flavor blends. Curly parsley is often used as a garnish. Fresh parsley is typically added toward the end of cooking to maintain the flavor. 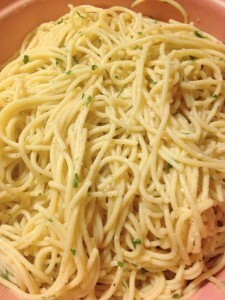 You can use either dry or fresh parsley for this recipe. Just remember when using dry spices, use about 1 teaspoon of dry in place of 1 tablespoon of fresh herbs because the dry spices will have a stronger flavor. Also, when using dry spices, give them a quick grind with your hand or even a mortar and pestle to release the flavor. Okay, back to the chicken. This dish uses boneless, skinless breasts that are pounded thin, so a little goes a long way, making it an economical meal. 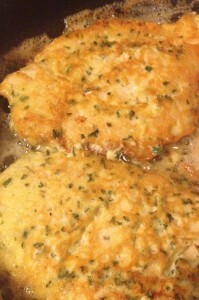 Boneless, skinless chicken thighs could also be used. 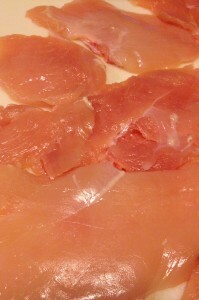 Pound the chicken breasts until they are about 1/4 inch thick. Place flour in a bowl and coat chicken pieces in flour. Shake off excess. Heat the olive oil and butter in a skillet. 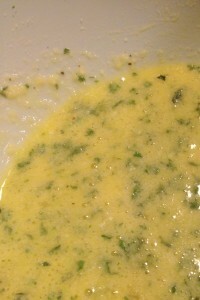 Beat the eggs, cheese, parsley, a squeeze of lemon juice, salt and pepper in a small bowl. Dip the chicken in the egg mixture. Gently shake off the excess. Place in the skillet. Cook until browned, about 3-4 minutes per side. 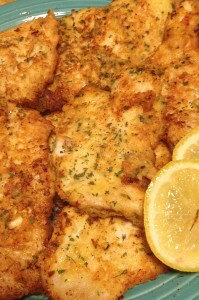 Squeeze some lemon juice over the chicken while it is cooking. Remove from the skillet. Squeeze on more lemon juice. Garnish with a sprinkle of parsley and some lemon slices. Serve immediately. I served these cutlets with angel hair pasta tossed with olive oil, butter, Parmesan cheese, garlic and parsley, and steamed asparagus. Once you have made these easy cutlets, you will find many dishes to use them with! 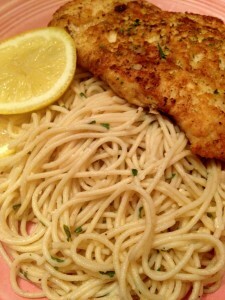 Feel free to change the herb used (try cilantro or basil) and leave out the lemon, use lime or even orange instead. The combinations are endless. Enjoy! Depending upon the size of the breasts, slice and pound to ¼-in thick. Place the flour in a shallow bowl and season with salt & pepper. Coat the chicken pieces with the seasoned flour. Beat the eggs in a small bowl, add the Parmesan, parsley and half the lemon juice. Heat the olive oil and butter over medium high heat in a large skillet. Dip the chicken pieces in the egg mixture, allowing excess to drip off. Place in the skillet and cooked until lightly browned, about 4-5 minutes per side. Squeeze additional lemon over cooking pieces. Remove to a warm platter and serve immediately to avoid pieces getting soggy. Garnish with lemon slices and additional parsley.